Benjamin W. Y. Lo, M.D., Ph.D.
	Audibert G, Steinmann G, de Talancé, et al. Endocrine responses after severe subarachnoid hemorrhage related to sodium and blood volume regulation. Neurosurgical Anesthesiology and Neuroscience. 2009 June; 108(6);1922-1928. Bederson JB. AANS Publications Committee. Subarachnoid hemorrhage: pathophysiology and management. Park Ridge, Ill.: American Association of Neurological Surgeons, 1997. Bewseoglu K, Holtkamp K, Steiger HJ, et al. Fatal aneurysmal subarachnoid hemorrhage. Clinical Neurology and Neurosurgery. 2013;115:77-81. Ebihara T, Kinoshita K, Utagawa A, et al. Changes in coagulative and fibrinolytic activities in patients with intracranial hemorrhage. Acta Neurochir. 2006 (Suppl);96:69-73. Espiner E, Leikis R, Ferch R, et al. The neuro-cardio-endocrine response to acute subarachnoid hemorrhage. Clinical Endocrinology. 2002; 56:629-635. Inamasu J, Nakatsukasa M, Mayanagi K, et al. Subarachnoid hemorrhage complicated with neurogenic pulmonary edema and Tako-tsubo-like cardiomyopathy. Neurol Med Chir (Tokyo). 2012; 52:49-55. Junttila E, Koskenkari J, Romppainen N, et al. Risk factors for 1-year mortality in patients with nontraumatic intracranial hemorrhage requiring intensive care. Acta Anesthesiol Scand. 2011;55:1052-1060. Kamath M, Watanabe M, Upton ARM. Heart rate variability (HRV) signal analysis: clinical applications. Boca Raton: Taylor & Francis, 2013. Kudo K, Konta T, Degawa N, et al. Relationship between kidney damage and stroke types in Japanese patients. Clin Exp Nephrol. 2012;16:564-569. Lo BWY, Fukuda H, Angle M, et al. Clinical outcome prediction in aneurysmal subarachnoid hemorrhage - Alterations in brain-body interface. Surg Neurol Int. 2016 Aug 1;7(Suppl 18):S527-37. Lo BWY, Fukuda H, Angle M, et al. Aneurysmal subarachnoid hemorrhage prognostic decision-making algorithm using classification and regression tree analysis. Surg Neurol Int. 2016 Jul 7;7:73. Lo BWY, Fukuda H, Nishimura Y, et al. Brain-body interactions: contemporary outcome prediction in aneurysmal subarachnoid hemorrhage using bayesian neural networks and fuzzy logic. New York: Nova Biomedical, 2014. Lo BWY, Fukuda H, Nishimura Y, et al. Pathophysiologic mechanisms of brain-body associations in ruptured brain aneurysms: A systematic review. Surg Neurol Int. 2015 Aug 11;6:136. Naidech A, Kreiter K, Janjua N, et al. Cardiac troponin elevation, cardiovascular morbidity and outcome after subarachnoid hemorrhage. Circulation. 2005; 112:2851-2856. Nakamura T, Okuchi K, Matsuyama T, et al. Clinical significance of elevated natriuretic peptide levels and cardiopulmonary parameters after subarachnoid hemorrhage. Neurol Med Chir (Tokyo). 2009; 49:185-192. Sato Y, Isotani E, Kubota Y, et al. Circulatory characteristics of normovolemia and normotension therapy after subarachnoid hemorrhage, focusing on pulmonary edema. Acta Neurochir. 2012; 154:2195-2202. Whiting P, Rutjes A, Westwood M, et al. QUADAS-2: A revised tool for the quality assessment of diagnostic accuracy studies. Annals of Internal Medicine 2011;155:529-536. Zacharia B, Ducruet A, Hickman Z, et al. Renal dysfunction as an independent predictor of outcome after aneurysmal subarachnoid hemorrhage. Stroke. 2009;40:2375-2381. Zygun D, Doig C, Gupta A, et al. Non-neurological organ dysfunction in neurocritical care. Journal of Critical Care. 2003 December;18(4):238-244. Adams S, Leveson S. Clinical prediction rules. BMJ. 2012 Jan 16;344. Altman D, Royston P. What do we mean by validating a prognostic model? Stat Med. 2000 Feb 29; 19(4):453-473. Bartfay E, Bartfay W. Accuracy assessment of prediction in patient outcomes. J Eval Clin Pract. 2008 Feb; 14(1):1-10. Beattie P, Nelson R. Clinical prediction rules: what are they and what do they tell us? Aust J Physiother. 2006; 52(3):157-63. Bouwmeester W, Zuithoff N, Mallett S, et al. Reporting and methods in clinical prediction research: a systematic review. PLoS Med. 2012; 9(5):1-12. Brismee J, Sizer P. Potential pitfalls of clinical prediction rules. J Man Manip Ther. 2008;16(3):182. Chiang V, Claus E, Awad I. Toward more rational prediction of outcome in patients with high-grade subarachnoid hemorrhage. Neurosurgery. 2000;46(1):28-36. Claassen J, Vu A, Kreiter K, et al. Effect of acute physiologic derangements on outcome after subarachnoid hemorrhage. Critical Care Med. 2004;32(3):832-838. Cook C, Brismee J, Pietrobon R, et al. Development of a quality checklist using delphi methods for prescriptive clinical prediction rules: the QUADCPR. J Manipulative Physiol Ther. 2010 Jan;33(1):29-41. Germanson T, Lanzino G, Kongable G, et al. Risk classification after aneurysmal subarachnoid hemorrhage. Surg Neurol. 1998 Feb;49(2): 155-63. Heuer G, Smith M, Elliott J, et al. Relationship between intracranial pressure and other clinical variables in patients with aneurysmal subarachnoid hemorrhage. J Neurosurg. 2004;101:408-416. Hier D, Edelstein G. Deriving clinical prediction rules from stroke outcome research. Stroke. 1991 Nov; 22(11):1431-6. Jaja BN, Cusimano M, Etminan N, et al. Clinical prediction models for aneurysmal subarachnoid hemorrhage: a systematic review. Neurocritic Care 2013;18(1),143-153. Juvela S. Alcohol consumption as a risk factor for poor outcome after aneurysmal subarachnoid haemorrhage. BMJ. 1992; 304:1663-1667. Kahn J, Caldwell E, Deem S, et al. Acute lung injury in patients with subarachnoid hemorrhage: incidence, risk factors and outcome. Crit Care Med. 2006;34(1):196-202. Karamankos P, von Und Zu Fraunberg M, Bendel S, et al. Risk factors for three phases of 12-month mortality in 1657 patients from a defined population after acute aneurysmal subarachnoid hemorrhage. World Neurosurg 2012;78:631-9. Kramer A, Bleck T, Dumont A, et al. Implications of early versus late bilateral pulmonary infiltrates in patients with aneurysmal subarachnoid hemorrhage. Neurocritical Care. 2009;10:20-27. Krishnamurthy S, Kelleher J, Lehman E, et al. Effects of tobacco dose and length of exposure on delayed neurological deterioration and overall clinical outcome after aneurysmal subarachnoid hemorrhage. Neurosurgery. 2007;61(3):475-481. Laupacis A, Sekar N, Stiell I. Clinical prediction rules. A review and suggested modifications of methodological standards. JAMA. 1997 Feb 12;277(6):488-94. Lindvall P, Runnerstam M, Birgander R, et al. The Fisher grading correlated to outcome in patients with subarachnoid hemorrhage. British Journal of Neurosurgery. 2009;23(2):188-192. Lo B, Macdonald RL. Health related quality of life after aneurysmal subarachnoid hemorrhage: new data from a large series in Germany. World Neurosurg. 2013 Feb;79(2):243-4. Macdonald R, Cusimano M, Etminan N, et al. Subarachnoid hemorrhage international trialists data repository (SAHIT). World Neurosurg. 2013 Mar-Apr;79(3-4):481-22. McGirt M, Woodworth G, Ali M, et al. Persistent perioperative hyperglycemia as an independent predictor of poor outcome after aneurysmal subarachnoid hemorrhage. J Neurosurg. 2007; 107:1080-1085. Miss J, Kopelnik A, Fisher L, et al. Cardiac injury after subarachnoid hemorrhage is independent of the type of aneurysm therapy. Neurosurgery. 2004;55(6):1244-1251. Mocco J, Ransom E, Komotar R, et al. Preoperative prediction of long-term outcome in poor-grade aneurysmal subarachnoid hemorrhage. Neurosurgery. 2006;59(3):529-538. Naidech A, Drescher J, Ault M, et al. Higher hemoglobin is associated with less cerebral infarction, poor outcome, and death after subarachnoid hemorrhage. Neurosurgery. 2006;59(4):775-779. Naidech A, Janjua N, Kreiter K, et al. Predictors and impact of aneurysm rebleeding after subarachnoid hemorrhage. Arch Neurol. 2005;62:410-416. Ogilvy C, Cheung A, Mitha A, et al. Outcomes for surgical and endovascular management of intracranial aneurysms using a comprehensive grading system. Neurosurgery. 2006;59(5):1037-1042. Qureshi A, Suri F, Sung G, et al. Prognostic significance of hypernatremia and hyponatremia among patients with aneurysmal subarachnoid hemorrhage. Neurosurgery. 2002;50(4):749-755. Rabinstein A, Friedman J, Nichols D, et al. Predictors of outcome after endovascular treatment of cerebral vasospasm. Am J Neuroradiol. 2004;25:1778-1782. Raymond J, Naggara O, Guilbert F, et al. Assessing prognosis from nonrandomized studies: an example from brain arteriovenous malformations. AJNR Am J Neuroradiol. 2011 May;32(5):809-12. Risselada R, Lingsma H, Bauer-MehrenA, et al. Prediction of 60 day case-fatality after aneurysmal subarachnoid haemorrhage: results from the International Subarachnoid Aneurysm Trial (ISAT). Eur J Epidemiol. 2010 April;25(4):261-6. Rosengart A, Schultheiss K, Tolentino J, et al. Prognostic factors for outcome in patients with aneurysmal subarachnoid hemorrhage. Stroke. 2007; 38(8):2315-21. Soehle M, Chatfield D, Czosnyka M, et al. Predictive value of initial clinical status, intracranial pressure and transcranial doppler pulsatility after subarachnoid hemorrhage. Acta Neurochir (Wien) 2007;149:575-583. Steyerberg E, Vickers A, Cook N, et al. Assessing the performance of prediction models: a framework for traditional and novel measures. Epidemiology. 2010 Jan;21(1):128-38. Toll D, Janssen K, Vergouwe Y, et al. Validation, updating and impact of clinical prediction rules: a review. J Clin Epidemiol. 2008 Nov;61(11):1085-94.
	van den Bergh W, Algra A, van der Sprenkel J, et al. Hypomagnesemia after aneurysmal subarachnoid hemorrhage. Neurosurgery. 2003;52(2):276-282. Yoshimoto Y, Tanaka Y, Hoya K. Acute systemic inflammatory response syndrome in subarachnoid hemorrhage. Stroke. 2001;32:1989-1993. Andreasen A, Bartek J, Andresen M, et al. Modifiable risk factors for aneurysmal subarachnoid hemorrhage. Stroke. 2013;44(12):3607-12. Barrett K, Ganong W. Ganong’s review of medical physiology. New York: McGraw-Hill Medical, 2010. Bederson J, AANS Publications Committee. Subarachnoid hemorrhage: pathophysiology and management. Park Ridge, Ill.: American Association of Neurological Surgeons, 1997. Butterworth R. The liver-brain axis in liver failure: neuroinflammation and encephalopathy. Nat Rev Gastroenterol Hepatol. 2013;10(9):522. Devinsky O. Effects of seizures on autonomic and cardiovascular function. Epilepsy Currents. 2004;4(2):43-46. Dimopoulou I, Kouyialis A, Tzanella M, et al. High incidence of neuroendocrine dysfunction in long-term survivors of aneurysmal subarachnoid hemorrhage. Stroke. 2004;35(12):2884-9. Dooley J, Sherlock S. Sherlock’s diseases of the liver and biliary system. Chichester, West Sussex; Hoboken, NJ: Wiley-Blackwell, 2011. Dube C, Brewster A, Baram T. Febrile seizures: mechanisms and relationship to epilepsy. Brain and Development. 2009;31(5):366-71. Dumont T, Rughani A, Silver J, et al. Diabetes mellitus increases risk of vasospasm following aneurysmal subarachnoid hemorrhage independent of glycemic control. Neurocrit Care. 2009;11(2):183-9. Guyton A, Hall J. Textbook of medical physiology. Philadelphia: Saunders, 2000. Haley EC Jr, Kassell NF, Alves WM, et al. Phase II trial of tirilazad in aneurysmal subarachnoid hemorrhage. A report of the Cooperative Aneurysm Study. J Neurosurg. 1995;82:786–90. Haley EC Jr, Kassell NF, Apperson-Hansen C, et al. A randomized, double-blind, vehicle-controlled trial of tirilazad mesylate in patients with aneurysmal subarachnoid hemorrhage: a cooperative study in North America. J Neurosurg. 1997;86:467–74. Horiuchi T, Tanaka Y, Hongo K. Surgical treatment for aneurysmal subarachnoid hemorrhage in the 8th and 9th decades of life. Neurosurg. 2005;56(3):469-75. Hosmer D, Lemeshow S, Sturdivant R. Applied logistic regression. Hoboken, NH: Wiley, 2013. Ilodigwe D, Gordon M, Kassell N, et al. Sliding dichotomy compared with fixed dichotomization of ordinal outcome scales in subarachnoid hemorrhage trials. J Neurosurg. 2013; 118(1), 3-12. Jang Y, Ilodigwe D, Macdonald R. Metaanalysis of tirilazad mesylate in patients with aneurysmal subarachnoid hemorrhage. Neurocrit Care. 2009;10(1):141-7. Jansen K, Lagae L. Cardiac changes in epilepsy. Seizure. 2010;19(8):455-460. Jennett B, Bond M. Assessment of outcome after severe brain damage: a practical scale. Lancet. 1975;480-4. Kang J, Shen W, Macdonald R. Why does fever trigger febrile seizures? J of Neurosci. 2006;26(9):2590-7. Kassell N, Haley E, Apperson-Hansen C, Alves W. Randomized, double-blind, vehicle-controlled trial of tirilazad mesylate in patients with aneurysmal subarachnoid hemorrhage: a cooperative study in Europe, Australia and New Zealand. J Neurosurg. 1996;84:221-8. Kim W, Neal L, Hoh B. Risk factors, incidence and effect of cardiac failure and myocardial infarction in aneurysmal subarachnoid hemorrhage patients. Neurosurg. 2013;73(3):450-7. Kumar P, Brown J, Dhar N, et al. Early vs delayed cerebral infarction after aneurysm repair after subarachnoid hemorrhage. Neurosurg. 2013;73(4):617-23. Lannes M, Teitelbaum J, del Pilar Cortes M, Cardoso M, Angle M. Milrinone and homeostasis to treat cerebral vasospasm associated with subarachnoid hemorrhage: the Montreal Neurological Hospital protocol. Neurocrit Care. 2012 June;16(3):354-62. Lanzino G, Kassel N. Double-blind, randomized, vehicle-controlled study of high-dose tirilazad mesylate in women with aneurysmal subarachnoid hemorrhage. Part II. A cooperative study in North America. J Neurosurg. 1999;90:1018-24. Lanzino G, Kassel N, Dorsch N, et al. Double-blind, randomized, vehicle-controlled study of high-dose tirilazad mesylate in women with aneurysmal subarachnoid hemorrhage. Part I. A cooperative study in Europe, Australia, New Zealand and South Africa. J Neurosurg. 1999;90:1011-7. Layon A, Gabrielli A, Friedman W. Textbook of neurointensive care. Philadelphia: Saunders, 2004. Lee K. The neuroICU book. New York: McGraw-Hill Medical, 2012. Lee V, Oh J, Mulvagh S, et al. Mechanisms in neurogenic stress cardiomyopathy after aneurysmal subarachnoid hemorrhage. Neurocrit Care. 2006;5(3):243-9. Lindekleiv H, Sandvei M, Romundstad P, et al. Joint effect of modifiable risk factors on the risk of aneurysmal subarachnoid hemorrhage: a cohort study. Stroke. 2012;43(7):1885-9. Lo B, Macdonald R, Baker A, et al. Clinical outcome prediction in aneurysmal subarachnoid hemorrhage using Bayesian neural networks with fuzzy logic inferences. Comput Math Methods Med. 2013:904860. Lo B, Nishimura Y, Fukuda H. Clinical outcome prediction using Bayesian regression and artificial neural networks. Horizons in Neurosciences Research, Volume 15. New York: NOVA Science Publishers, 2014. Mangieri P, Suzuki K, Ferreira M, et al. Evaluation of pituitary and thyroid hormones in patients with subarachnoid hemorrhage due to ruptured intracranial aneurysm. Neuro-Psiquiatr. 2003;61(1):14. Mazarati A. Cytokines: a link between fever and seizures. Epilepsy Currents. 2005;5(5):169-70. Mrozek S, Vardon F, Geeraerts T. Brain temperature: physiology and pathophysiology after brain injury. Anesthesiol Res Pract. E pub 2012 Dec 26. O’Carroll R, Ebmeier K, Dougall N, et al. Regional cerebral blood flow and cognitive function in patients with chronic liver disease. Lancet. 1991;337(8752):1250-1253. Olivier D, Arnaud D, Roover P, et al. Brain edema and intracranial hypertension in fulminant hepatic failure. World Journal of Gastroenterology. 2006;12(46):7405-7412. Park J, Woo H, Kang D, et al. Formal protocol for emergency treatment of ruptured intracranial aneurysms to reduce in-hospital rebleeding and improve clinical outcomes. J Neurosurg. E pub Nov 18, 2014. Payen J, Fauvage B, Falcon D, et al. Oedème cérébral par lésion de la barrière hématoencéphalique: mécanismes et diagnostic. [Cerebral edema by lesion of the blood-brain barrier: mechanisms and diagnosis.] Annales françaises d’anesthesie et de reanimation: 2003;2(3):220-225. Rowland L, Pedley T, Merritt H. Merritt’s neurology. Philadelphia, PA: Lippincott Williams & Wilkins, 2010. Rowland M, Hadjipavlou G, Kelly M, et al. Delayed cerebral ischaemia after subarachnoid haemorrhage: looking beyond vasospasm. British Journal of Anaesthesia. 2012;109(3):315-29. Sadamasa N, Koyanagi M, Fukuda H, et al. Is aneurysm repair justified for the patients aged 80 or older after aneurysmal subarachnoid hemorrhage? J Neurointerv Surg. 2014;6(9),664. Schneider H, Kreitschmann-Andermahr I, et al. Hypo-thalamopituitary dysfunction following traumatic brain injury and aneurysmal subarachnoid hemorrhage: a systematic review. JAMA. 2007 Sep 26;298(12):1429-38. Steyerberg E, Vickers A, Cook N, et al. Assessing the performance of prediction models: a framework for traditional and novel measures. Epidemiol. 2010;21(1):128-38. Todd M, Hindman B, Clarke W, et al. Perioperative fever and outcome in surgical patients with aneurysmal subarachnoid hemorrhage. Neurosurg. 2009;64(5):897-908. Torbey M. Neurocritical care. Cambridge; New York: Cambridge University Press, 2010. Varelas P. Seizures in critical care: a guide to diagnosis and therapeutics. Totowa, NJ: Humana Press, 2005. Wijdicks E. The practice of emergency and critical care neurology. New Work: Oxford University Press, 2010. Zhang S, Wang L, Liu M, et al. Tirilazad for aneurysmal subarachnoid hemorrhage (Review). Cochrane Database Syst Rev. 2010 Feb 17. Breiman L. Classification and regression trees. Belmont, CA: Wadsworth, 1984. De’ath G, Fabricius K. Classification and regression trees: a powerful yet simple technique for ecological data analysis. Ecology 2000(81):3178-92. Germanson T, Lanzino G, Kongable G, Torner J, Kassell N. Risk classification after aneurysmal subarachnoid hemorrhage. Surg Neurol 1998;49:155-63. Kahn J, Caldwell E, Deem S, Newell D, Heckbert S, Rubenfeld G. Acute lung injury in patients with subarachnoid hemorrhage: incidence, risk factors and outcome. Crit Care Med 2006;34:196-202. Karamanakos P, von Und Zu Fraunberg M, Bendel S, et al. Risk factors for three phases of 12-month mortality in 1657 patients from a defined population after acute aneurysmal subarachnoid hemorrhage. World Neurosurg 2012;78:631-9. Lo B, Stojic F, Spears J, Schweizer T, Macdonald R. Clinical outcomes, stroke trials and cognitive outcome. In The Behavioral Consequences of Stroke. (pp. 283-314). New York: Springer, 2014. 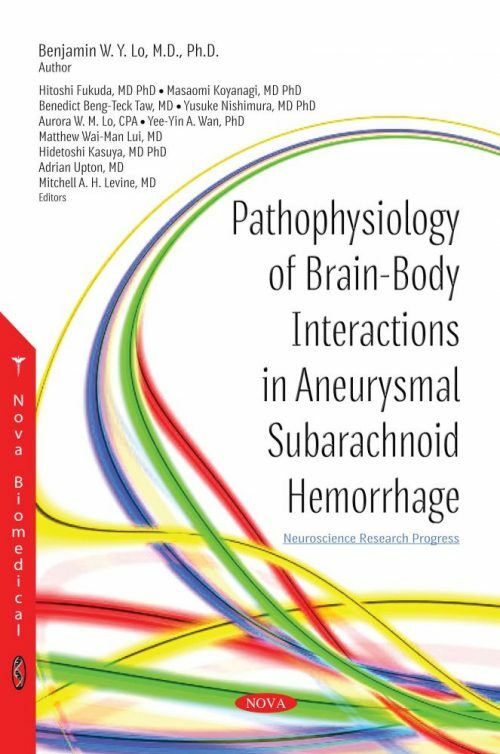 Lo B, Fukuda H. Pathophysiology of brain somatic interactions in aneurysmal subarachnoid hemorrhage – review and update. Brain Disord Ther 2015;4:183. Lo B, Fukuda H, Nishimura Y, et al. Systematic review of clinical prediction tools and prognostic factors in aneurysmal subarachnoid hemorrhage. Surg Neurol Int 2015;6:135. Lo B, Fukuda H, Nishimura Y, et al. Pathophysiologic mechanisms of brain-body associations in ruptured brain aneurysms: a systematic review. Surg Neurol Int 2015;6:136. McGirt M, Woodworth G, Ali M, et al. Persistent perioperative hyperglycemia as an independent predictor of poor outcome after aneurysmal subarachnoid hemorrhage. J Neurosurg 2007; 107:1080-5. Moisen G. Classification and regression trees. In Encyclopedia of Ecology. (pp 582-88). Oxford, UK: Elsevier, 2008. Ogilvy C, Cheung A, Mitha A, et al. Outcomes for surgical and endovascular management of intracranial aneurysms using a comprehensive grading system. Neurosurg 2006;59:1037-42. Rabinstein A, Friedman J, Nichols D, et al. Predictors of outcome after endovascular treatment of cerebral vasospasm. AJNR 2004;25:1778-82. Risselada R, Lingsma H, Bauer-Mehren A, et al. Prediction of 60 day case-fatality after aneurysmal subarachnoid haemorrhage: results from the International Subarachnoid Aneurysm Trial (ISAT). Eur J Epidemiol 2010;25:261-6. Rosengart A, Schultheiss K, Tolentino J, et al. Prognostic factors for outcome in patients with aneurysmal subarachnoid hemorrhage. Stroke 2007;38:2315-21. Sanchez C, Ogilvy C, Carter B. Outcomes studies in cerebrovascular neurosurgery. Neurosurg Focus 2007;22(3):E11. Yohannes Y, Webb P. Classification and regression trees, CART: a user manual for identifying indicators of vulnerability to famine and chronic food insecurity. Washington, D.C.: International Food Policy Research Institute, 1999.